M.F.K Fisher once said: “Cheese is a food both sophisticated and simple humans love. ” She’s right – at times I am simple, at times I am (at least attempting to be) sophisticated, but I always love cheese, in any form. 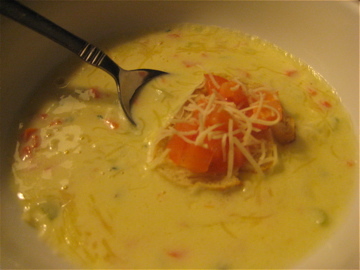 The few times I’ve had cheese soup, I’ve been sorely disappointed. It usually takes the form of slightly thinner cheese whiz, with that unnatural orange hue and sticky consistency. Sometimes the soup has unidentifiable food particles suspended in its gelatinous structure, but usually it seems best not to analyze the bits too closely. 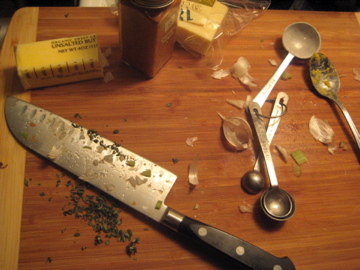 To avoid these problems, I consulted several different recipes – and paid special attention to pictures – before attempting to create my own Cheddar Soup. 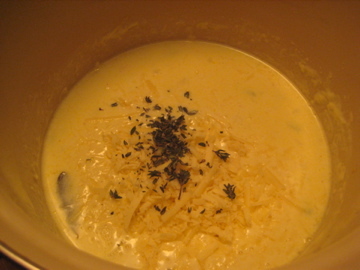 I wanted something lighter in texture, more like a broth and less like traditional cheese glop, so I tossed out any recipe that used heavy cream. I also didn’t want the flavor to be of just cheese, so I paid special attention to formulas that used things like liquor or beer. The following recipe was exactly what I wanted, except for one thing: I bought an entire bottle of Sherry to use just 3 tablespoons in this soup. Now I fear I’ll be googling “recipes with Sherry” for the next two months to get rid of this stuff. Oh well. Over medium heat, melt butter in a large pot, add onion, carrot, celery, and garlic, cook until garlic is fragrant. Add flour and stir, coating the vegetables, about 2 minutes. Whisk in chicken broth and half and half. Increase heat and bring mixture to a boil, then reduce heat and let simmer for 10 minutes. Remove from heat, add cayenne, bacon drippings, and sherry, stir. Whisk in cheese and thyme, season with salt and pepper. Serve in a bowl, topped with bacon, tomato, and toasted baguette slice. Sprinkle with cheese – Red Dragon if you have it, plain cheddar if you don’t.